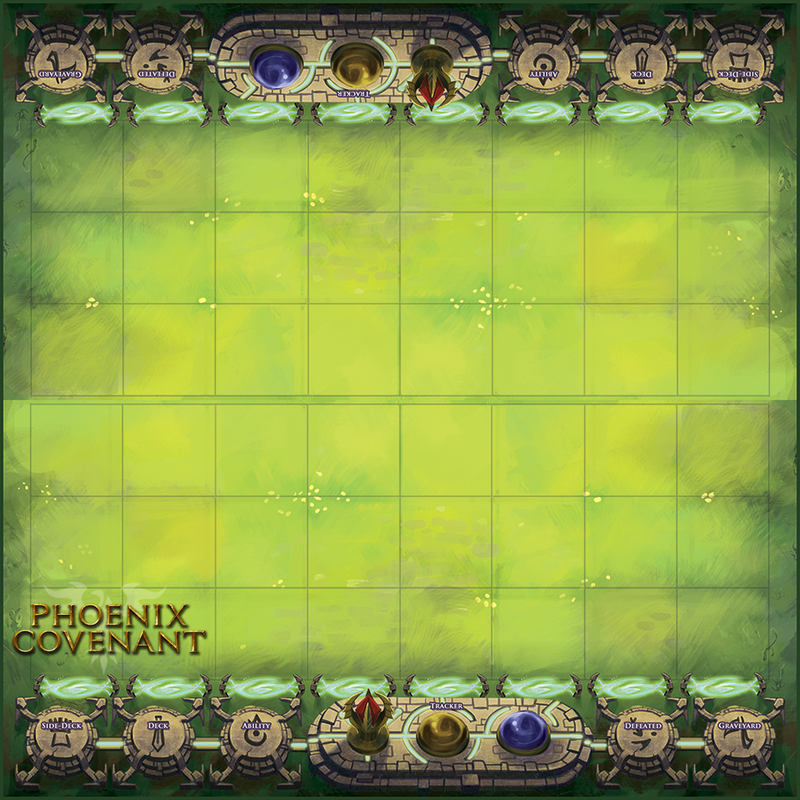 Phoenix Covenant is a game by Easwaran Subbaraman, Sriraman Subbaraman, Adam Porroni and Soren Fox, published by Hikari Games. It is for 2-4 players. In this game, players will take on the role of Officer Corps Initiate. They will build an army from various types of units to form an elite fighting force that they will use to best their fellow officers with in strategic combat. The player that can best do this will be declared the winner. To begin, the board should be placed in the middle of the table. Players should either create their own deck following the rules for building a deck or they may choose to use one of the preconstructed decklists from the rulebook as a guide. For beginning players, it’s recommended to use one of these preconstructed decks. Each player places their structures and any auxillary units into their side deck, which is placed face up below their side of the board in it’s corresponding spot. The units, spells and other cards create the player’s main deck and should be shuffled together and placed face down below the board in it’s spot. Each player is given a resource tracker which should be set to 25 life points. The first player is chosen. They then set their trackers to 1/1 Command Points and 0/0 Mana Points, while the other players sets their tracker to 1/1 Command Points and 1/1 Mana Points. Each player now draws 6 cards to form their starting hand. If a player wishes they may Mulligan. In this case, the player may keep up to 3 cards in their hand and reshuffle the discarded cards back into their deck. They then draw up to their hand size of 6. If they still aren’t happy with their hand, they are allowed to keep doing this. However, each time the player Mulligans after the first time, their hand size is decreased by 1. Once players have their starting hand, play now begins. The game is played over several rounds. Each round a player is allowed a single turn of play. Each turn is divided into 3 phases; start phase, action phase and end phase. The first phase is the start phase. In this phase, players will follow a few actions. They will un-exert all their units and structures by flipping their exert tokens to the unexerted side. They will then draw a card from their deck. Their Command Points and Mana Points are refilled back to their maximum values. Finally, they resolve any start phase abilities or effects on any of their cards. Players can deconstruct any structures that they control by discarding them to their defeated pile. The next phase is the action phase. In this phase, the player is allowed to do several actions during their turn. They can gain and spend 2 Essence points, once every turn. They can either add 1 to both their their Command Points and their Mana Points, or they can add 2 to either of these. The points are added to both the Max and Current point values. As long as a player is able to meet the requirements, they can play a card or activate a unit or structure. To be able to play a card, the player must pay it’s cost. To play a unit, the player must also reduce their max command points by the unit’s tier value. If the unit also has a mana burst value on it as well, then the player must also reduce their max mana points by this value. The unit is then place on any unoccupied square in the player’s home row and with an exerted token on it. It should be noted that Commander units allow a player to gate in a unit beside them. This means that once a Commander has been played to the home row and then moved out into the field, they create squares that allow units to be played onto just like the home row. However, a player can not use this ability to gate in another Commander unit or a unit this is of a higher tier than the Commander unit. The player can also play a spell card. This is done by simply paying the mana burst cost and resolving the effect of the spell. The card is then placed in the defeated pile. There are 2 types of spell. Strategic spells can only be used on the player’s turn, while Tactical spells can be used on either player’s turn. Another card that can be played is a structure. 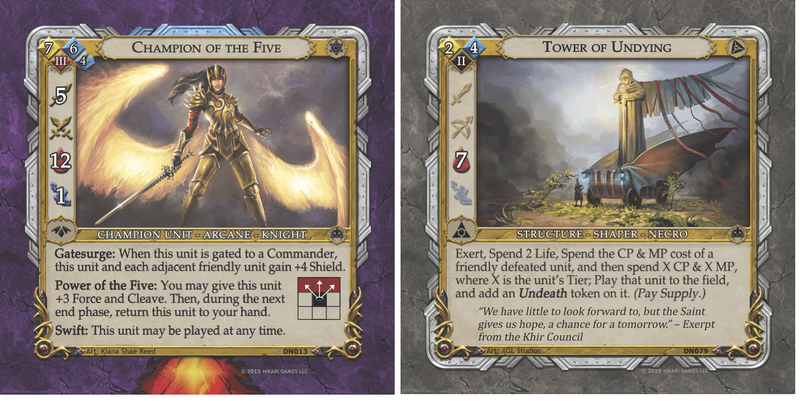 These are played from a player’s side deck and must be played onto a hard point. They don’t require a supply cost. They come into play exerted just like units do. Players can also activate cards that they already have in play. The player simply chooses a unit to activate. Each time a unit is activated, they can either move and turn or act. To move and turn, the player simply chooses an un exerted unit and moves it a number of adjacent squares up to it’s move value. They they are able to turn the unit to face a specific direction. For a unit to act, the player chooses whether to attack or use an ability action. The attack will cause the unit to exert. Attacking has 3 stages; declaration, resolution and damage. First the player declares which unit they are attacking with and which they are attacking. It must be within the activated unit’s range. The unit is then exerted with an exert token. Next, the damage dealt to the targeted unit is computed by resolving any applicable armor or weakpoints against the force of the attack. Finally damage is resolved based on the previous results. If the unit is reduced to 0 hit points, it is defeated and placed into the defeated pile. The player regains it’s supply value. Spells can be used during the declaration as well as the damage phases. A player can attack bases and hard points as well as units. If any damage is to be applied during the damage phase, it reduces the player that owns it’s life points instead. If a player chooses to use a unit’s ability, the player must first pay the cost of the ability before resolving the ability. It should be noted that an exerted unit can not use any abilities that makes it exert. Once the player completes the action phase by either exerting all their units or by choosing to end the phase, play then moves to the end phase. The last phase is the end phase. In this phase, players discard cards from their hand to their defeated pile until they reach their hand limit. Any cards in play with end phase abilities or effects resolve at this point. Once this is completed, a new round begins. The game continues until one of the players has been reduced to 0 life points. At this time, the game ends. The player that reduced their opponent to 0 is the winner. This game has a lot of really amazing looking pieces. Of course the game comes with 4 prebuilt card decks as well as a puzzle deck to help you learn the game and a couple of quick reference cards. There’s also an expansion pack of card to add to everything. The artwork on these is absolutely gorgeous. It looks like something taken from Magic the Gathering or one of those Boris Vallejo paintings. The cards are not like you’re regular deck of playing cards. These are square like a tile instead of a card. Just looking at the icons and text on these makes me think of Magic the Gathering. I mean, it’s not the exact same look but it definitely gives me that type of vibe. The game also comes with lots of cardboard tokens for everything from shields and health to poison and scrap tokens. Also included with the game are these really awesome looking resource trackers. I immediately thought of the dials in those Fantasy Flight LCG games like Lord of the Rings and Star Wars the Card Game. Finally the game has this super sturdy board. It has a very similar look as the one for Summoner Wars Master Set. However this one has green squares instead of the brown ones in Summoner Wars. Everything looks really great and is really great quality. The artwork is phenomenal and I really enjoy just looking at all the cards. Overall the game is really great. The rulebook for this game is a real piece of work. The first half of the book is a walkthrough of the core mechanics of the game. Using the puzzle deck, it gives you scenarios to work through as well as the answer on how you should have performed. By the time that you get through it all, you’ve got a really good handle on the game itself. The second half of the book is a straight up rulebook. This includes the game setup as well as all the different phases and rules associated with each one. There are also rules on deck building as well as a fairly good sized dictionary of terms used in the game. Finally there is a section for each of the deck lists and which cards belong to which deck along with space to write your own ideas. There are lots of great looking pictures and plenty of examples of gameplay. Working your way through the walkthrough and then reading the rules, there’s nothing that you won’t understand afterwards. The rules are pretty straight forward and I didn’t see anything that was too difficult to understand. I should mention that the last page of the book has a handy quick reference guide to help while playing the game. Overall, I think the designers did a really great job here. I’d give it an A+. This game is a really unique tactical experience. It combines aspects of games like Summoner Wars and Magic the Gathering and weaves them together to form a really great blend of mechanics. In a lot of ways you get that feeling that this is one of those big time collectible card games like Magic the Gathering. It also has that living card game feel, because it has everything you need to play in the box. You don’t have to buy tons of random packs of cards to get what you want. The game comes with 4 different decks as well as a stack of cards to customize your own deck with. Each deck has a rather unique feel, much like what the starter decks for Magic the Gathering feel like. There are a lot of options available to each player when playing the game. Working out how best to attack your opponent’s life points is the key. The game is a little bit slow starting out but once you start getting stuff rolling out onto the field, it’s all hands on deck. After playing through the game a couple of times, you’ll definitely want to build your own deck. I really like that the game makes this a possibility and even provides rules on how to customize your own deck. Or course the game is simply begging for expansions decks to be able to further customize your game with. I like the strategic feel of the game. Fans of strategy games like Summoner Wars will definitely enjoy this one. With the movement of units across the board and the various attack abilities of the cards, you’ll definitely feel right at home here. Magic the Gathering fans will enjoy the various spells and units that you can command. Miniature wargamers may even enjoy this one as you get a lot of the same feel of a skirmish style game without the miniatures. Overall, this game is really amazing and a lot of fun. I highly recommend it. There’s really a lot to like here. 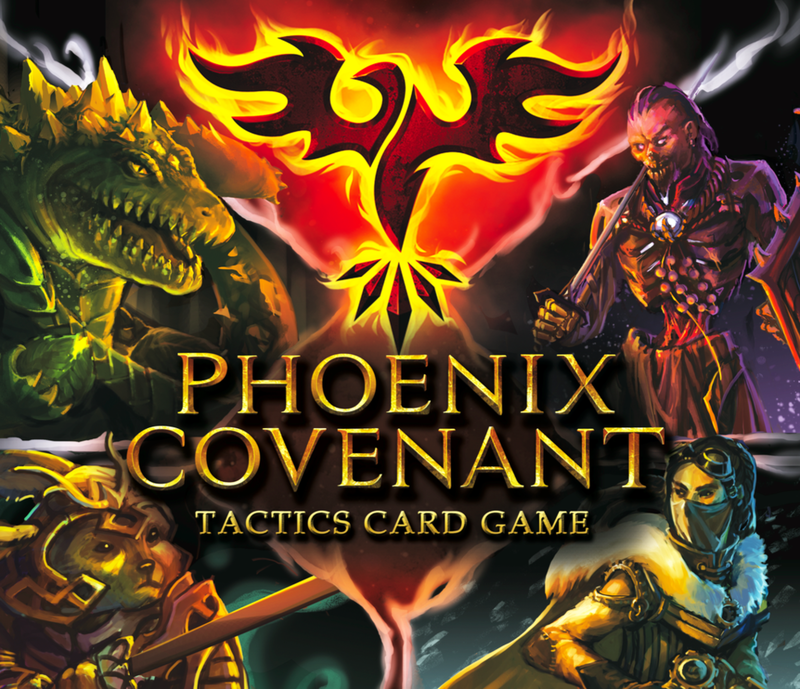 Phoenix Covenant is a medium weight tactical card game that combines elements of both CCG and LCGs into a unique experience. The game isn’t extremely long. Most game sessions last around 45 minutes or so. The game doesn’t take a long time to learn either. You can be up and running in about 10-15 minutes. The game looks beautiful, especially the cards. I really love the stylized artwork that reminds me of the designs on cards for Magic the Gathering. The game involves a good bit of strategy, which will make strategy gamers extremely happy. For me, it feels like a mesh of Magic the Gathering and Summoner Wars. I really like the tactical combat that this one has, as well as the possibilities for custom deck building. I’m really hoping that there will be expansion decks in the near future to further customize the decks with. There’s really a lot to like about this game. Fans of games like Summoner Wars or CCGs like Magic the Gathering should really enjoy this one. I highly recommend it. It definitely scratches a lot of itches. For more information about this game, please check out Hikari Games at their site. This entry was posted in Reviews and tagged adam, adam porroni, board, board games, card, card games, covenant, easwaran, Easwaran Subbaraman, fox, games, hikari, hikari games, phoenix, phoenix covenant, porroni, soren, soren fox, sriraman, Sriraman Subbaraman, subbaraman. Bookmark the permalink.